Washington (CNN) - The second ranking House Democrat predicted his party was in good position to retake control of the House of Representatives in the 2014 midterm election. House Democratic Whip Steny Hoyer pointed to a fundraising advantage for Democrats, lower poll numbers for congressional Republicans, divisions inside the GOP ranks, and a good recruiting class of Democratic challengers, and said "all of those combined in my view give me great optimism that we're going to win back the House." Democrats need to pick up 17 seats to regain the majority in the House, and most political handicappers say that with the narrow list of competitive congressional districts the odds are long that they can reach that goal. 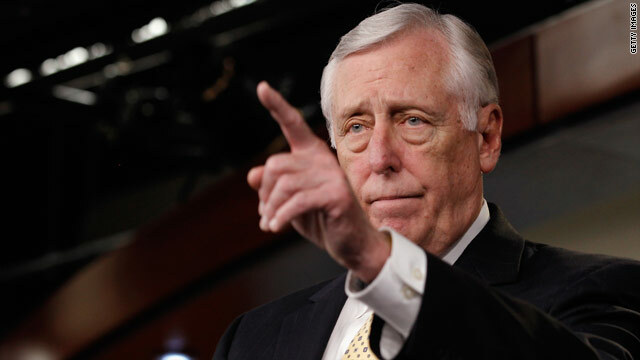 In a session with reporters inside his Capitol Hill office on Monday, Hoyer noted that he made a similar prediction in 2006 that House Democrats would win control - one that many dismissed at the time - but he was proven right on election night that year. When pressed about the President's low approval ratings potentially hurting Democrats' chances, Hoyer pointed to those of House Speaker John Boehner and Senate GOP Leader Mitch McConnell, which he noted were significantly lower. He said the focus would be less on the President and more on the candidates in individual districts. He expected the President would help raise money for both House and Senate Democratic candidates, and would lay out a set of issues that resonate with the public. Hoyer also anticipated that both former President Bill Clinton and former Secretary of State Hillary Clinton would be "very, very helpful around the country," and noted that Bill Clinton has been active in campaigning for House candidates in the last several election cycles. Pressed if former President Clinton could help more than President Obama, Hoyer diplomatically answered, "I think they are both helpful in their own way." Hoyer conceded that Democrats had a greater advantage in the polls last autumn, during the government shutdown, but the problems with the rollout of Obamacare evened things out with Republicans. House Republicans have made running against Obamacare the centerpiece of their midterm election strategy, but Hoyer said confidently "every month it's going to get better" and said the new health care law "is going to be a positive, not a negative" in the November election. The National Republican Congressional Committee hit back at Hoyer's remarks. "If Steny Hoyer got out of the beltway once in a while he'd know that Americans are suffering more and more from the impacts of Obamacare and have zero interest in putting the political party that brought us that law back in total control of Washington," NRCC Press Secretary Daniel Scarpinato said. The party of science and reason, uh huh. Completely derranged. RCP has the GOP up 2 in the generic ballot. In 1994 the GOP didn't go ahead until October and in 2010 not until summer. Hoyer is saying this so try and enthuse the base so they don't stay home. Bill Clinton has never successfully campaigned for offer candidates. People are forgetting the GOP won both houses of congress under Clinton and held them 12 years. Wow, is this man deluded. And quoting him is why CNN is at the forefront of cable news. In other news, the homeless guy down the street says that aliens are out to get him. He's right. The delusional Guns Over People tea potty wingnuts are spiking the football again like they did in 2012. They never learn. The USA would be 100% better off if the GOP incompetent teaparty obstructionist were kicked to the curb in November . The dems only need 17 seats, don't believe the GOP lies that they are going to keep the house,go out and vote in this IMPORTANT election and it won't be for republicans unless you approve of their stonewalling and instruction of our goverment that you pay taxes for and the GOP shows up for work only 100 days a year and accomplishes NOTHING. Name one thing the GOP has passed in the last six years that helped the American people and not THEMSELVES ??????farmbill???? ?